Berlin has begun the reconstruction of what was once one of the world’s grandest buildings, King Frederick the Great’s palace. Some parts of the original building dated back to the 15th Century, but it was destroyed in 1950. 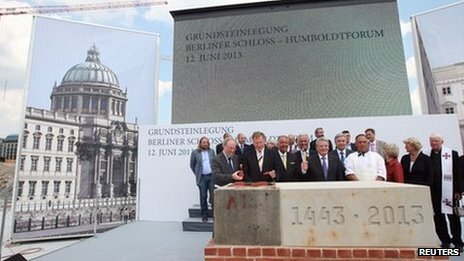 Germany’s President Joachim Gauck laid the foundation stone for the replica. The project will cost around 600 million euros and is controversial at a time when Germany is urging European countries to rein in their debt. Most of the bill is being paid by German tax payers. The plan is to recreate the original ornate facade, but with a modern interior. The new palace will house collections of non-European art, scientific pieces, libraries and cultural centres. It is due to be finished in 2019. The palace became the principle residence of the kings of Prussia in 1701. The original palace survived the bombings of the World War II, albeit badly damaged. But it was dynamited by the communist authorities of East Germany in 1950 and replaced with the Palace of the Republic, which housed the DDR’s parliament and a cultural and leisure centre. In a reunified Berlin in 2006, that building was torn down to make way for the reconstruction of the original palace. There has been controversy about the cost of the project at a time of austerity, as well as over the merits of trying to recreate buildings from the past. Germany has already reproduced, quite faithfully, other destroyed landmarks, including the Adlon Hotel on its original site next to Berlin’s Brandenburg Gate.